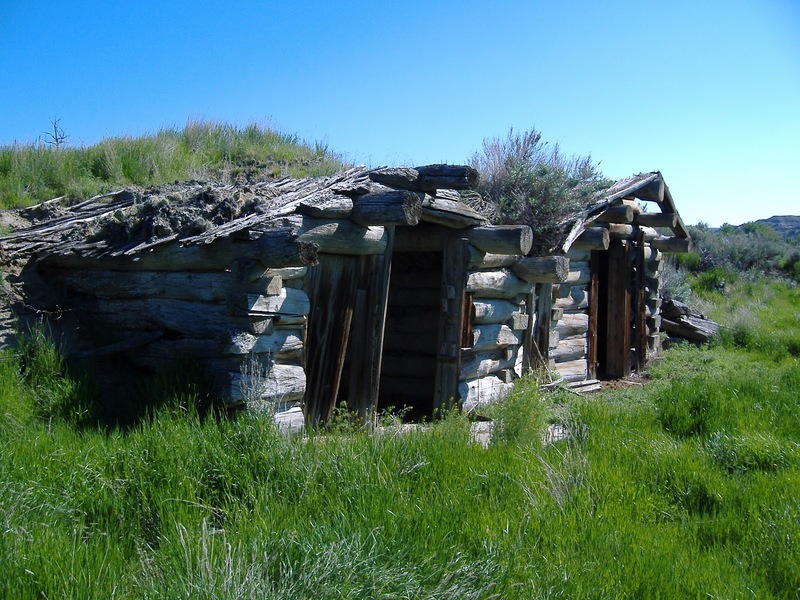 This is Happy Jack’s (or as it used to be called, Old Mexico Ranch), an old homestead occupied by Happy Jack Jackson from 1903 to 1942. There are a couple of log cabins, some with cacti growing on the roof. 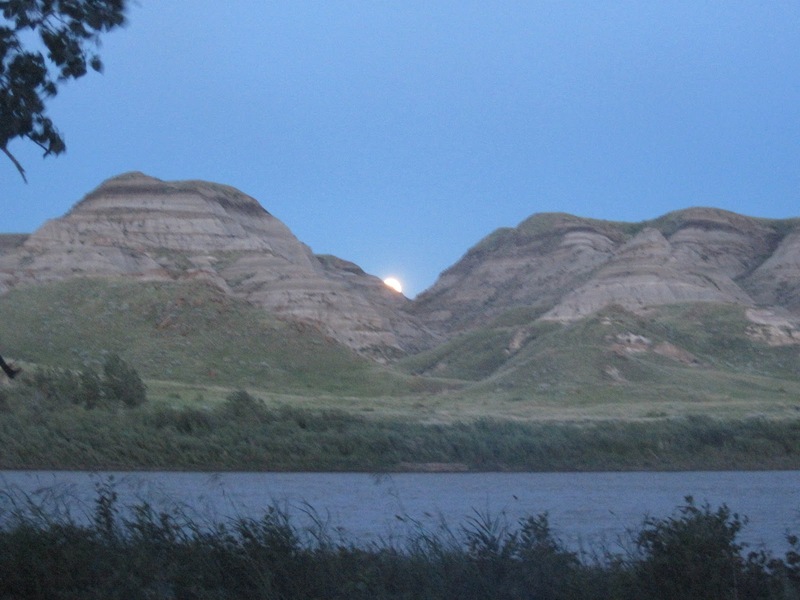 Happy Jack’s is found on the north side of the Red Deer River in Dinosaur Provincial Park, and is the home base for the Currie Lab when we do fieldwork in DPP. The cabins are full of rattlesnakes, so rather than camping right out in the field, we have a really nice spot in the cottonwood grove near the river. 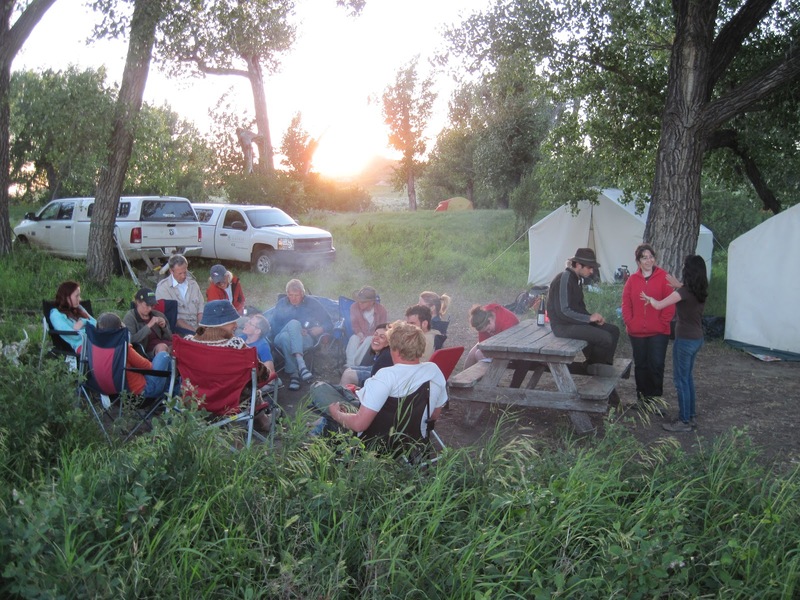 The night I took this photo there were 18 people in camp, but most of the time our crew is around 10 people. The badlands around Happy Jack’s have been very productive for the last five years, and we’ve collected several very nice skeletons that unfortunately I can’t say anything about yet (but I promise they’re good). This year we didn’t have any major finds, but we did a lot of prospecting and collected lots of interesting small things. 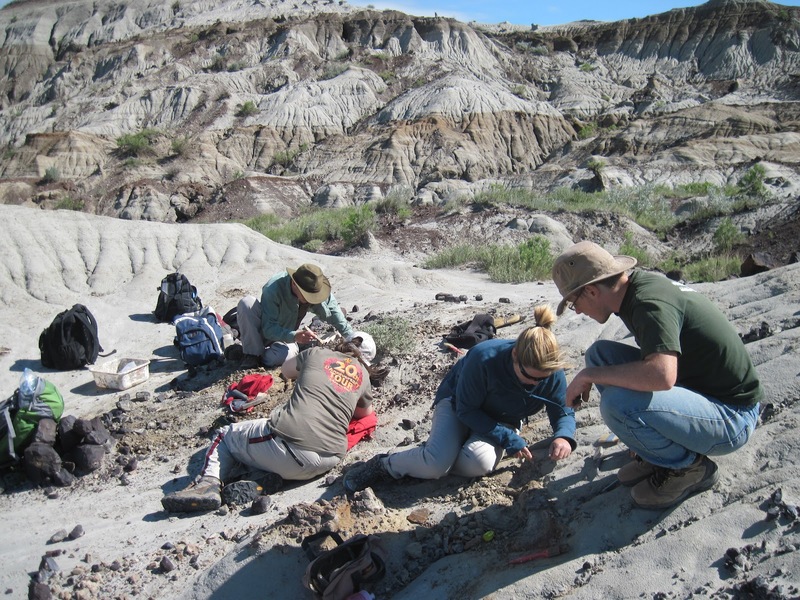 In the photo above, a bunch of us are checking out an articulated hadrosaur, that was unfortunately too far gone to be salvageable or worth collecting. It was a nice spot on a sunny day, however, so nobody minded too much. 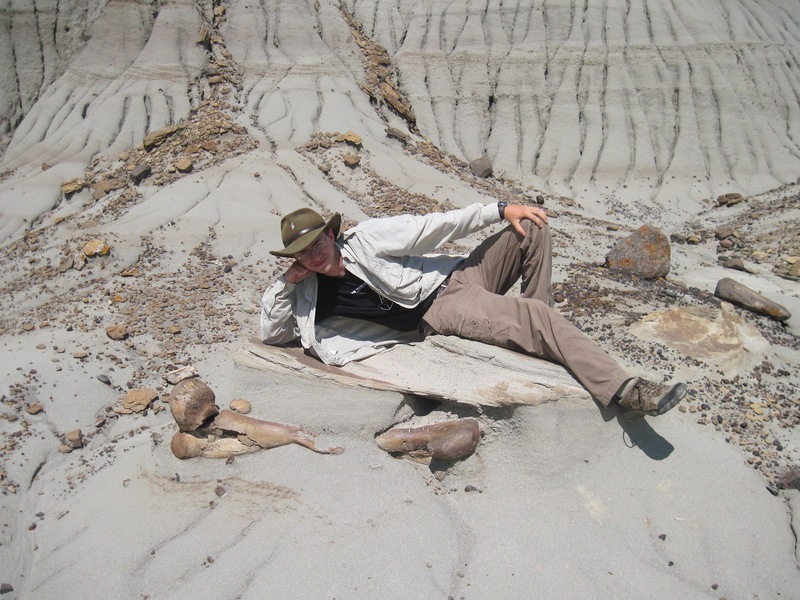 There are always more bones in Dinosaur Provincial Park. And when I say there are always more bones, I mean it. Dinosaur Park is kind of a ridiculous place. 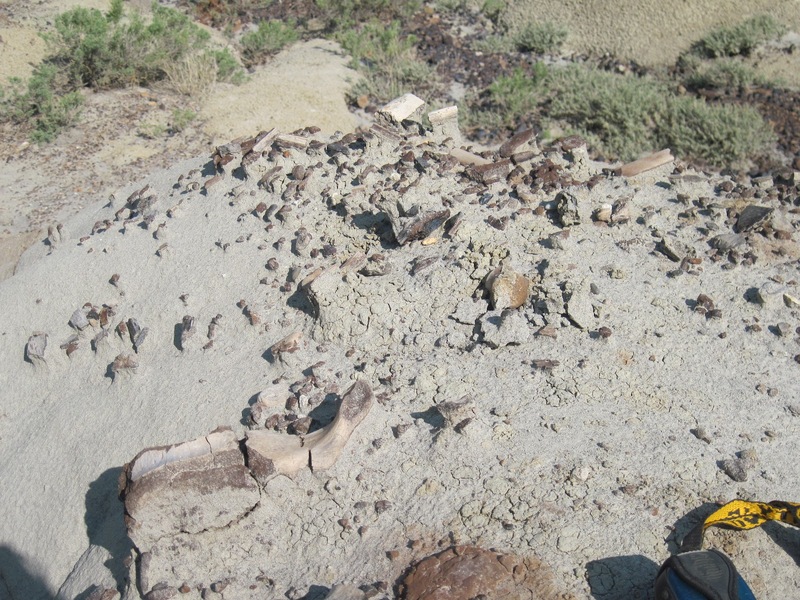 There are so many bones that we only collect things that are complete and well-preserved, so I didn’t bring back the vertebra you can see in the lower left of this picture (although I did get a hadrosaur frontal from this spot). There are many places where you can’t help but walk all over bone fragments, because they are just so numerous. And then there are bones that look like they’re straight out of a ‘How to be a Palaeontologist’ book, like this femur my friend Scott found. We have some awfully nice scenery in camp. So you have plenty of rattlers in Canada, that far north. Good idea to leave them alone. Better they be numerous than rodents. 🙂 Yes great scenery btw.